﻿ WRC Rallye Monte-Carlo 2019 - Sébastien Ogier Vs Ott Tänak - Comparison, Flatout & Max Attack! WRC Rallye Monte-Carlo 2019 - Sébastien Ogier Vs Ott Tänak - Comparison, Flatout & Max Attack! 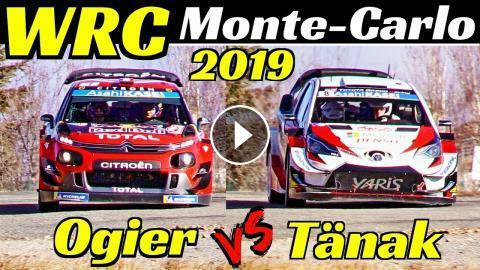 Finally, the WRC 2019 started with the Monte Carlo Rally, we are near Gap, in the French Alps and this is the video about Sèbastien Ogier Vs Ott Tänak with the videos taken during the special stages I followed. Epic Flatouts, Max Attack, Action & Pure Sound! Citroen C3 WRC Plus vs Toyota Yaris WRC Plus. The rally saw Ogier's victory of just 2.2 seconds from Neuville, a gap was so low that he had not seen for 40 years and the lowest ever in the history of rallies. In the final classification of the Rally, the couple TÄNAK/JÄRVEOJA reached the third place overall. 4x & 10x WRC Cars/Crew Comparison Experiment + Slow-Motion - Rally Monte Carlo 2018 - Action! WRC Rally Monte Carlo 2018 - Ott Tänak & Martin Järveoja - Toyota Yaris WRC Highlights! WRC Rally Monte Carlo 2018: Saturday Action - Maximum Attack, Speed, Sliding & More! WRC Rallye Monte-Carlo 2019 - Shakedown & Highlights - Action & Pure Sound! Fiat 124 Abarth Rally R-GT - WRC Rally Monte Carlo 2018 - Action, Flatout, Powerslide & Pure Sound! Sébastien Ogier & Julien Ingrassia - WRC Rally Monte Carlo 2018 Winners! - Max Attack, Flatout! Rally Monte-Carlo 2018 SS10 MAXIMUM ATTACK: WRC Cars into a slippery 6th gear corner!! WRC 2018: Rallye Monte-Carlo - Best of Action, MAX ATTACK, Mistakes, Speed & More! WRC Rallye Monte-Carlo 2018: Thursday Night Stage w/ High Speed Fly Bys & Glowing Brakes! WRC Rallye Monte-Carlo 2019 - Ps6 Valdròme-Sigottier Highlights - Flatout, Max Attack & More! WRC Rallye Monte-Carlo 2019 - Ps1 La Brèole-Selonnet - Night Stage, Flatout & Glowing Brakes!